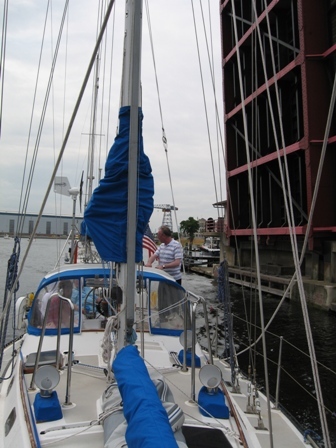 On July 26th Marco and I sailed into Holland. This part of the trip meant a great deal to Marco, to be able to sail back to where he was born. 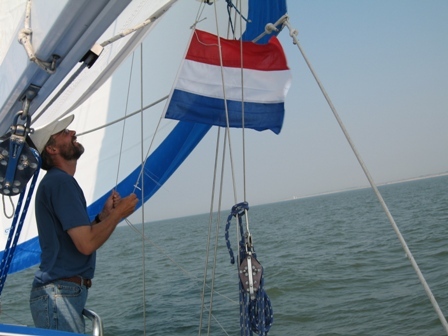 This picture is of Marco raising the courtesy flag of Holland when we sailed into Dutch waters. 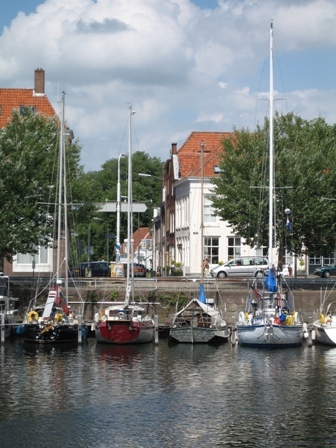 Our first Dutch port was Breskens, Holland. 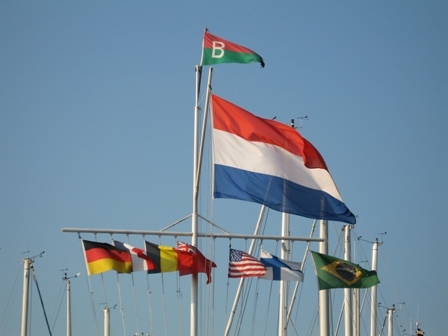 All the ports here fly flags from the visiting foreign boats in the harbor. 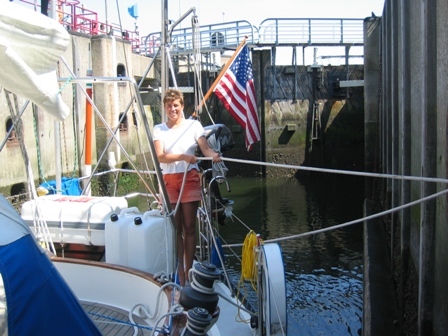 When we arrived into Breskens the US flag was not flying and by the time we had checked in and returned to the boat they had raised the US flag also. 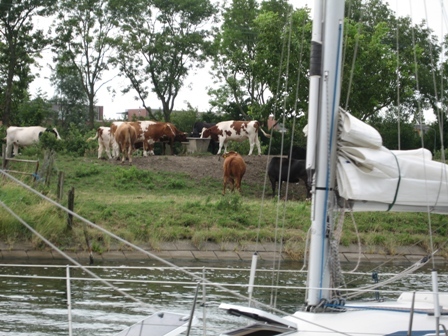 This continued in each harbor we sailed in to in Holland. It made us feel very welcomed. We stayed in Breskens for 3 days and met some really nice people. A lot of people stopped by to ask us questions about our trip across the Atlantic and we even ran into Gary from Draco. I had met Gary in the grocery store in Horta, in the Azores, where we were both buying what we thought was hamburger but it ended up being pet food. Who knew what Portuguese was anyway, for "meat for animals". Needless to say we did not end up buying the meat but it was a close call. 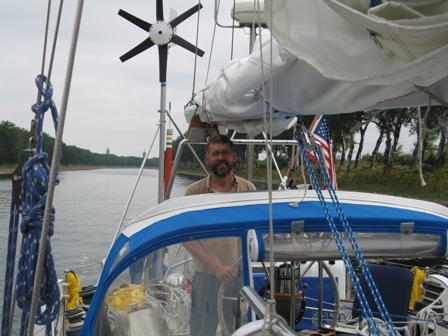 Gary is from Texas and sold Draco to a Dutch man and assisted the new owner in sailing her to Holland. It was really nice running in to him again and he also gave us all of his books he had read on his trip. Our library is well stocked once again. Thanks Gary!!!! 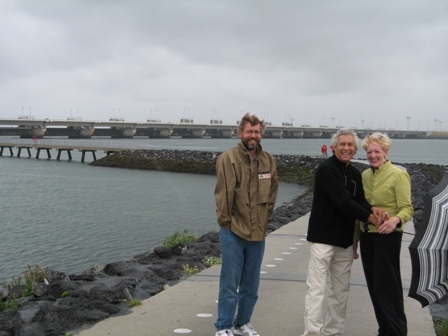 In Breskens, Andre and Esther, our great friends from the open ocean, met us and helped us sail Dalliance across the Westerschelde to Vlissingen. 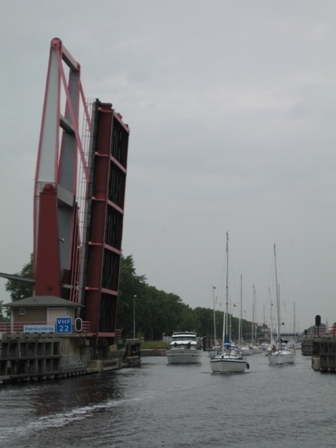 Here we got to maneuver our first lock, Vlissingen Lock. 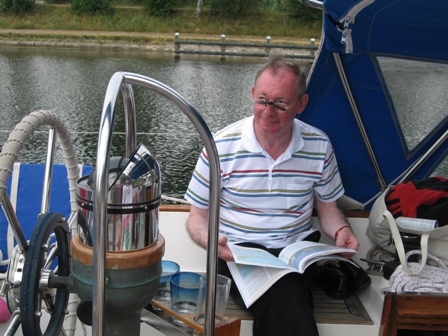 Marco had never taken a boat through a lock before and I had not been in one for over 20 years. Andre and Esther joined us on our trip through, and it was a great experience!! 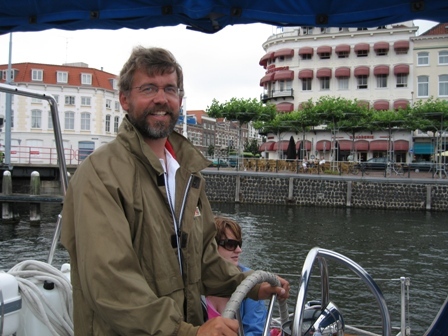 After arriving in Vlissingen, the 4 of us got in their car and drove to Middelburg where they have their boat, Sandettie. 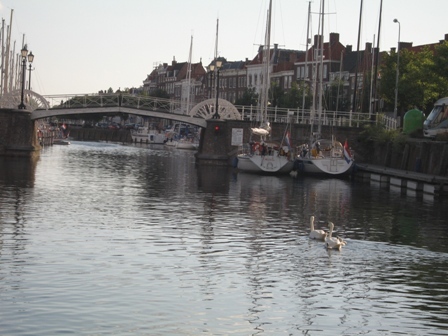 Once we saw how beautiful Middelburg was and knowing we could be with Andre and Esther again we decided to take Dalliance up the canal and stay in Middelburg for the rest of the stay in Holland. Andre and I on the bow of Dalliance in the Vlissingen Lock. 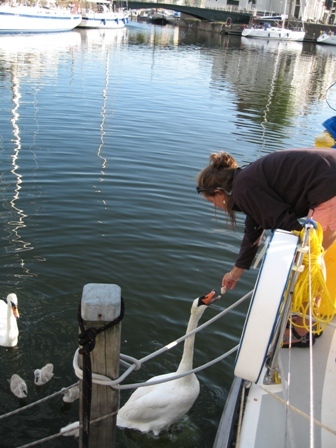 Esther holding the stern line as the water rose in the lock. The next day, July 30th, Marco's Uncle Jos, Aunt Liesbeth and cousins Irene and Agatha helped us take Dalliance up the canal to Middelburg. We had to pass under 5 bridges while going through the canal. In the past, the bridge tender would have lowered a wooden shoe down and you would put his fee in the shoe and then he would open the bridge for you. Those days are long gone now and the bridges are controlled remotely, with the use of video cameras. We had such a great day with Jos, Liesbeth and the girls. There was a lot of laughing and story telling going on during the entire trip. Jos had also brought us some mail from Marco's parents and in the package was my official Captains license. When Agatha heard that both Marco and I were Captains, she asked, "If you have two Captains on board who is going to go down with the ship?" Jos navigating us through the canal. 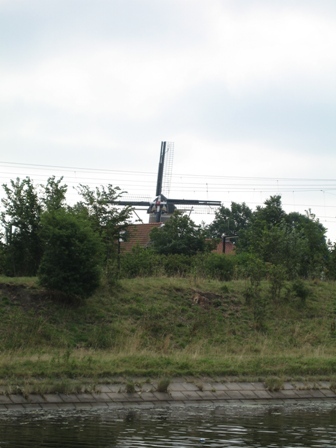 This route from Vlissingen to Middelburg was very scenic, as we went through picturesque Zeeland with minaret spires, church domes, gabled buildings, and even the occasional windmill. Captain Marco motoring through the canal and into the town of Middelburg. 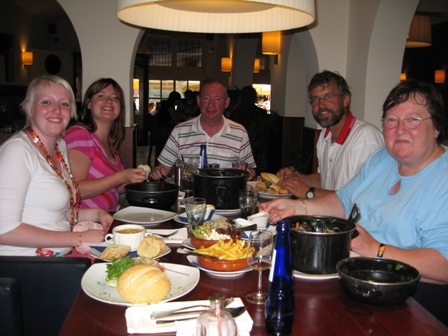 Left to right - Agatha, Irene, Jos, Marco, and Liesbeth enjoying lunch in Middelburg after navigating the bridges and the canal. Here is Sandettie, Andre and Esther's boat, on the far left and Dalliance on the far right. 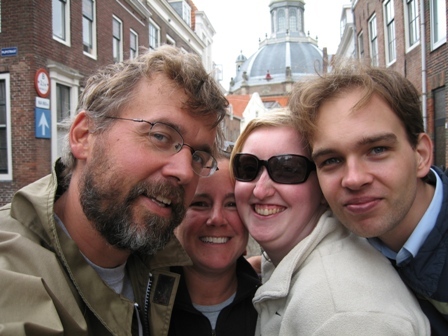 It was so special getting to be neighbors with them in Middelburg. 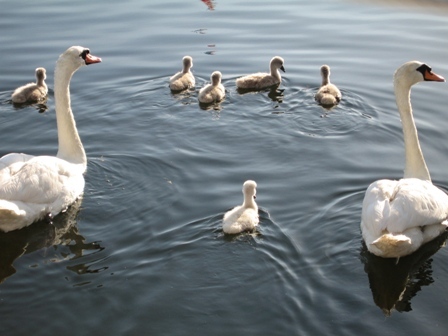 We had frequent visitors of Swans, ducks and geese with their young while staying in Middelburg. I know I should of not have fed them, but I just couldn't help it. At least is was whole grain bread. Our view from the stern of Dalliance in our slip in Middelburg. We were truly in the middle of the town. 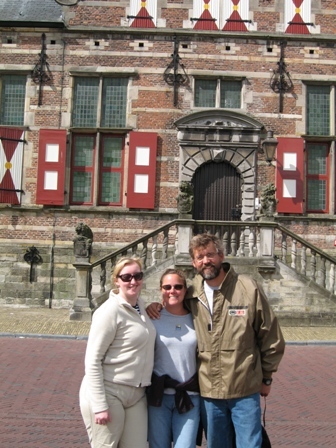 Marco's other cousin, Astrid and her friend Philip also came and visited us while we were in Middelburg. We toured the city and had a really great day. 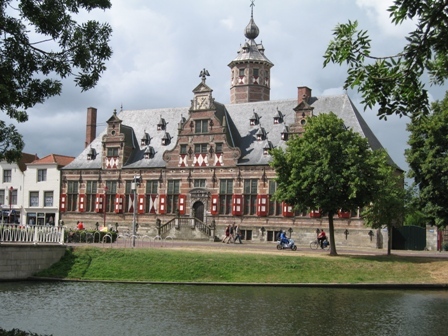 Middelburg, which is the capital of Zeeland, was badly bombed in the Second World War but most of the town has been beautifully restored and in some cases replicas of the old buildings were built. 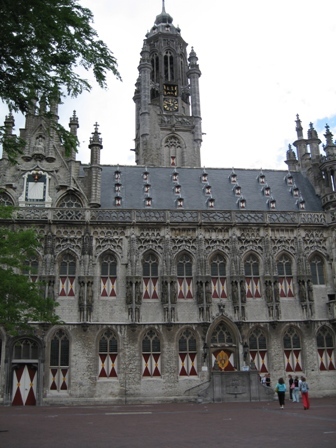 The 15th Century Town Hall of Middelburg. 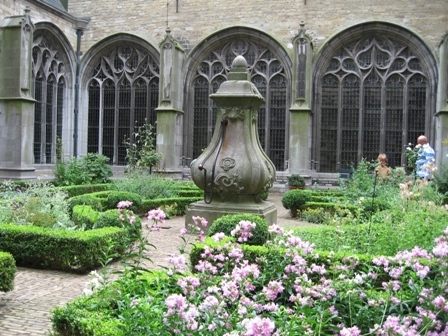 These 2 pictures were taken in the Medicinal Garden of an old Abbey. 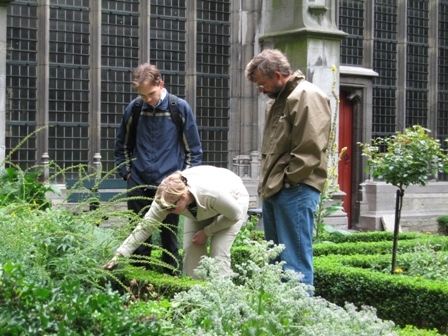 The many plants here were described in a book about how they were used to treat illness during the 15th century. Marco's Tanta Wil and Humphrey also came and spent the day with us. 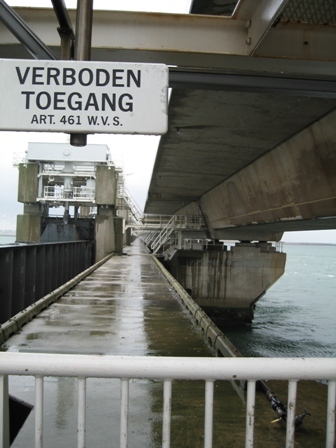 They took us to the Delta Works in Zeeland. It was really fascinating seeing how they have managed to divert the water in Holland. 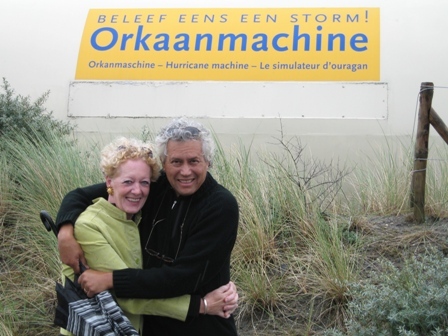 There was also a Hurricane Machine at the Delta Works but we all agreed that the wind was stronger outside than inside the simulation. We also took a tour inside of a whale at the Delta Works . Inside the exhibit they had a skeleton of a Finback Whale that had washed up on the beach a couple of years ago. 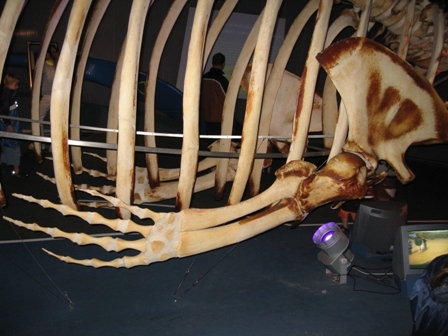 It was amazing to see how similar the bone structure of the whales fin is to our own upper extremity. 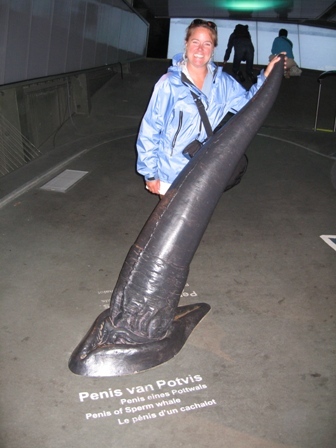 They also had many other fascinating facts about whales. 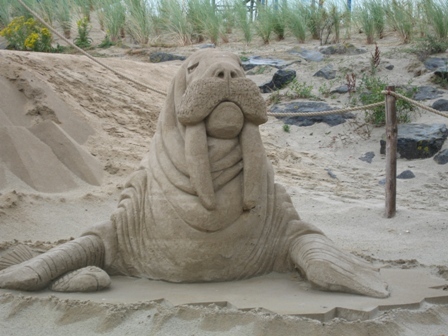 Outside the Delta works there was also a sand sculpture area. 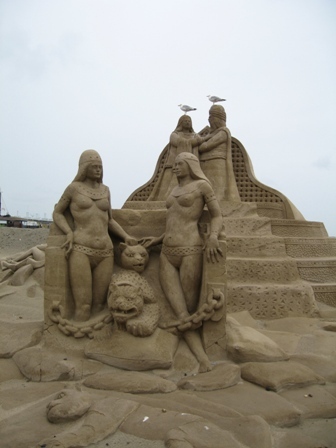 It was really amazing how detailed they sculptures were. Thanks Tante Wil and Humphrey for such a wonderful day. We can't wait to see you in France. 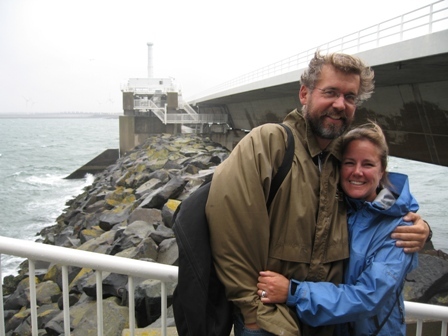 Before we knew it, it was time to leave Holland and start heading south to France. We both wished we could of stayed longer to see more of Marco's family. 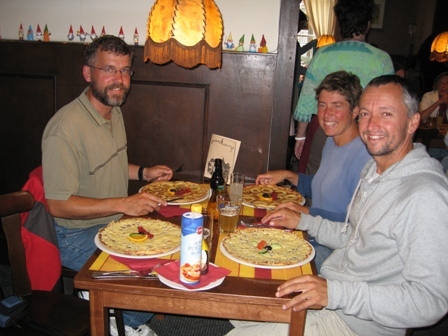 Andre and Esther took us out to a Pannenkoek Huis (Pancake House) for our last dinner in Holland. Andre and Esther saying goodbye from our slip in Middelburg. Marco and I both had lumps in our throats saying goodbye to our dear friends. 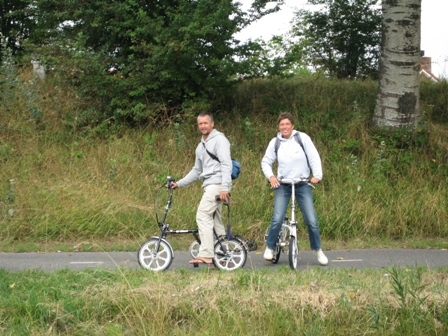 Andre and Esther also rode their vouw fietsen (folding bicycles) down the canal as we went with Dalliance until we got to the locks. Our send off as we left Holland!!! We miss you guys already and can not wait for you to visit us in the US or the Caribbean. The offer is still open for you to sail from the Canaries to Barbados, don't forget!! !